Spirituality, Technology, Inspiration: Installing Ubuntu 10.10 Maverick Meerkat from USB Flash Drive. It's been long my blog not updated due to some personal difficulties. Here today I'm writing a guide on how to install our favorite Linux distribution Ubuntu Maverick Meerkat 10.10 without a CD/DVD. First of all you need to download the ISO image file from the ubuntu. [Note: For most users using Desktop and Laptop we should download the ISO image of Desktop since there are so many variants for different computers i.e. Netbook, Server, etc]. All ubuntu have two versions i.e. 32-bit and 64-bit. If you are not an advanced user and unless you have 4GB of RAM and at least Core2Duo processor powered computer don't download the 64-bit version. If you have patience and high speed internet you can download Ubuntu Maverick Meerkat from here. Normally you would burn the ISO image into the CD. But since we are installing it from a USB drive make sure you have at least 1GB pen drive. You can use 'unetbootin' if you are making the bootable drive from Windows. But if you are already running older Ubuntu then you can run this program [System---->Administration---->Startup Disk Creator]. Here's the screenshot. Select your image file of Ubuntu then insert a pen drive of at least 1 GB then click on 'Make Startup Disk'. The process will take about 10 mins. Then its ready to install Ubuntu from your pen drive. Now reboot your computer and arrange the boot order so that you can boot from the pen drive. After booting from the pen drive the first screen will ask for Trying Ubuntu or Installing it. If you are sure you want to install Ubuntu then select Install or if you want to see a demo then just click the 'Try' to see it in action without installing. Following are the installation steps. In the second screen 'Preparing to install Ubuntu' just click Forward. In the third screen we have partitioning option. 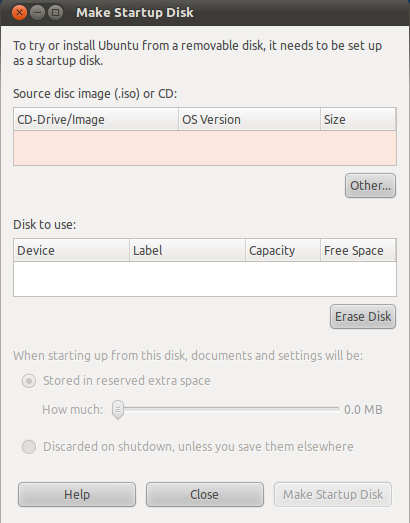 You can use the entire disk to install Ubuntu [Note: Selecting this option will erase you entire hard drive and all your data is lost so make sure you backup all your files.] The another option says for manual partition. I've put the screenshot after manual partition. While partitioning manually make sure you make at least three partitions i.e. 100MB partition for '/boot'. 2048MB partition for swap(virtual memory) and at least 10GB for '/' (root) partition. In the fourth screen you will be asked to select the time zone. In the fifth screen you will be asked to select the Keyboard layout. In the last screen you will be asked to select your username and password. That's all now you can enjoy your Ubuntu. The installation will finish in almost 15 mins if you do not select to download updates from internet during installation as asked in the second screen.